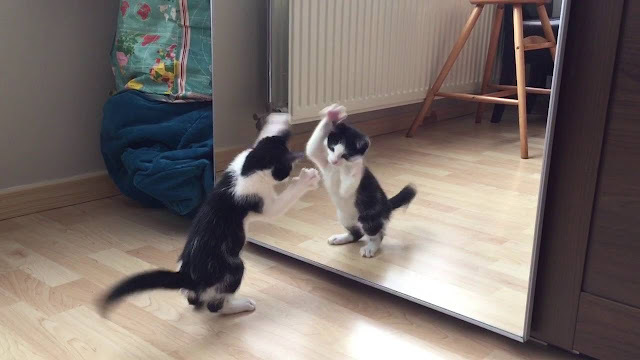 Wiske the kitten has officially discovered a mirror, and life will never be the same. Upon encountering the giant mirror, Wiske went through the seven stages of seeing her reflection for the first time: intrigue, amusement, confusion, terror, life crisis, anger and, finally, lack of caring. 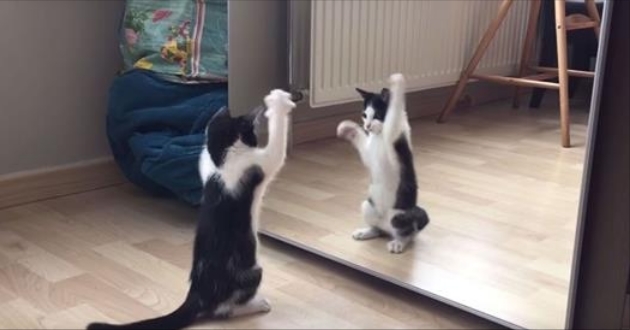 Do cats know it’s “them” when they look in the mirror? Yes and no. It really depends on the cat. If our cat thinks their reflection is another cat, they are going to react to it as though it was another cat. Whether arching their back or extending their nose in friendship, our cat is acting as though there is another cat there. Yet this response is usually tempered by the puzzling feedback they get from this other cat who is mimicking their moves, yet is not registering on their other senses. Responses to "Beyond perplexed kitten sees her reflection for the first time"